THE DISABILITY DISCRIMINATION ACT SETS OUT VARIOUS REQUIREMENTS REGARDING HOW COMMUNAL AND PUBLIC BUILDINGS MUST ACCOMMODATE THE NEEDS OF DISABLED PEOPLE. SSG always take DDA adaptations into primary consideration when undertaking any installation at a social housing property. Although it should be noted that the actual extent will be determined by (a) what the client has prescribed and (b) what is practical, given that some properties pre-date the Act itself. 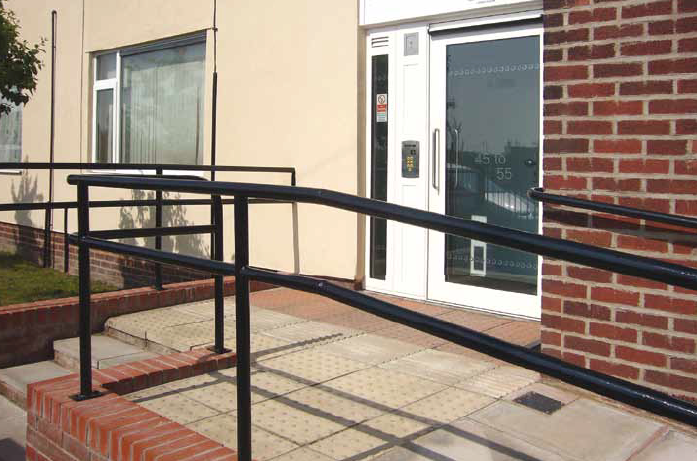 Invariably include door widths, vision panels, ramps and handrails. However, there are numerous other considerations such as low-level fob entry, the distance of a fob reading post from the door, braille and yellow bezels on intercom panels, entry phones that feature flashing LED’s for the hard of hearing and so on. Automated doors can be fitted to the majority of communal entrances and will be installed in accordance with BS 7036 – the code of practice for safety at powered doors for pedestrian use. Systems are also fitted with manual override so that doors can still be opened and closed in the event of a failure.